The Dutch government, the national Tenants’ Union (Woonbond) and the national umbrella organisation for housing associations (Aedes) agreed in 2012 on an average energy performance for the non-profit sector, which represents 31% of the total Dutch housing stock. This average was expressed in a so-called Energy Index, the Dutch official measure to denote energy performance of a building, and should be 1.25 in 2020, meaning an energy saving of around 30 % compared with 2012. This aim is still valid today. In order to monitor the progress of the energy performance in the non-profit housing sector towards this aim, the monitor SHAERE is used. SHAERE (Sociale Huursector Audit en Evaluatie van Resultaten Energiebesparing) which translates in English as Social Rented Sector Audit and Evaluation of Energy Saving Results, is a collective database, operational since 2010, which contains the dwellings of the participating housing associations. For the EPISCOPE pilot action we use this monitor. The housing associations report their entire stock to Aedes in the beginning of each year. Reference date is December 31th of the previous year. The database includes information per dwelling such as the energy label, geometry, insulation and installation systems (DHW, space heating, ventilation). During the EPISCOPE project possible paths on how to reach the national targets were assessed, and feasible refurbishment strategies for the residential building stock were identified. These studies identified that efficient strategies largely vary with the type of dwelling. Trend and scenario analyses were carried out considering efficiency measures in the context of energy renovations in the existing building stock. 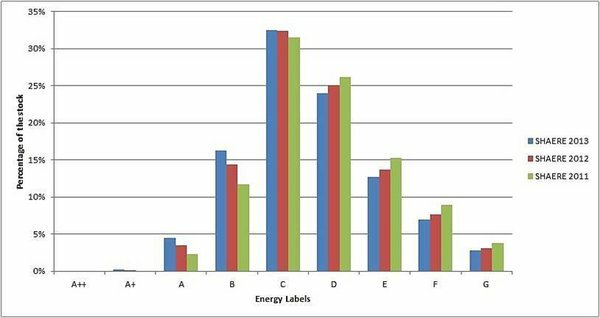 These analyses included an nZEB level for for new buildings and buildings to be renovated.